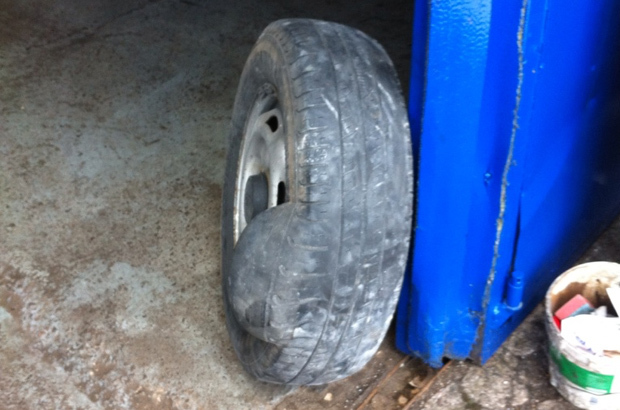 Here’s an extreme example of a bulge in a tyre’s side wall showing that the internal structure has failed. It would only be a matter of time before the tyre rapidly deflates, resulting in potential loss of control of the vehicle. Clearly it makes you wonder how this hadn’t been picked up earlier by the vehicle user - or had it been ignored? Remember, when inspecting a tyre it’s not just the tread and tread depth we’re interested in. The whole tyre must be examined for damage, such as cuts, tears and signs of possible internal structural failure. This will usually be obvious if there are lumps or bulges on the outer surface caused by the separation or failure of the underlying structure and cords of the tyre. In this example, the existence of the underlying failure of the tyre’s structure is clear with air leaking through the carcass resulting in a large bulge on the outer wall. However, sometimes signs of potential failure, like deformed shape or lumps and undulations in the outer surfaces, can only be identified by closer examination. See section 4.1 D1 of the Inspection Manual for more details on inspecting the condition of tyres. Please keep sending us your horror stories, whether it’s dangerous items or unusual things you find when testing vehicles and motorcycles. Also make sure you give us information about the defect so that we can tell your story. DO WE NEED TO SIT AN ASSESSMENT EXAM TO HAVE FAILED THIS ? Find it hard to believe someone was driving around with that and not noticing bit sceptical about it as it is possible it would catch the wheel arch when turning on lock etc as it would have rubbed through the sidewall would rather have seen a pic of it still on the car. please tell me this was not on a car in use!! !